'Sun' a rarity for months glistens on the harbor on Cape Ann MA recently. 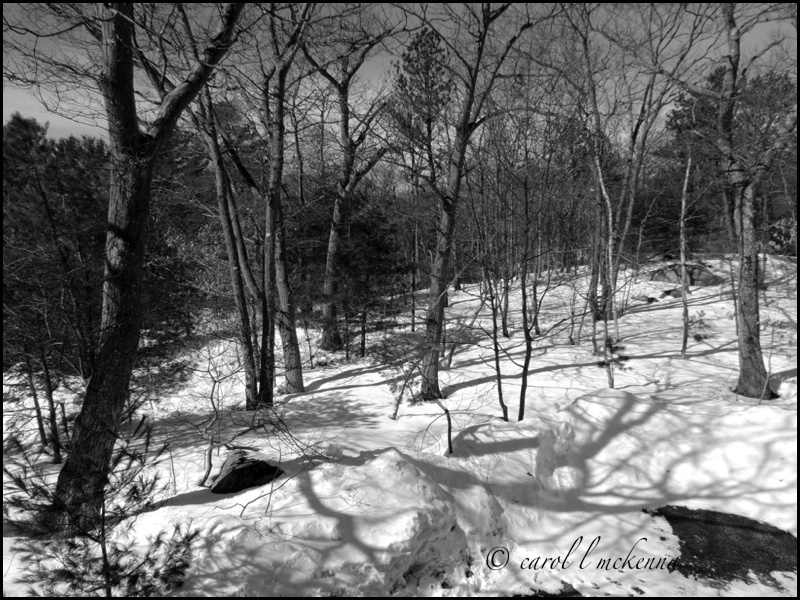 'Back yard of our house still piled with snow but sun glistens and creates shadows today. 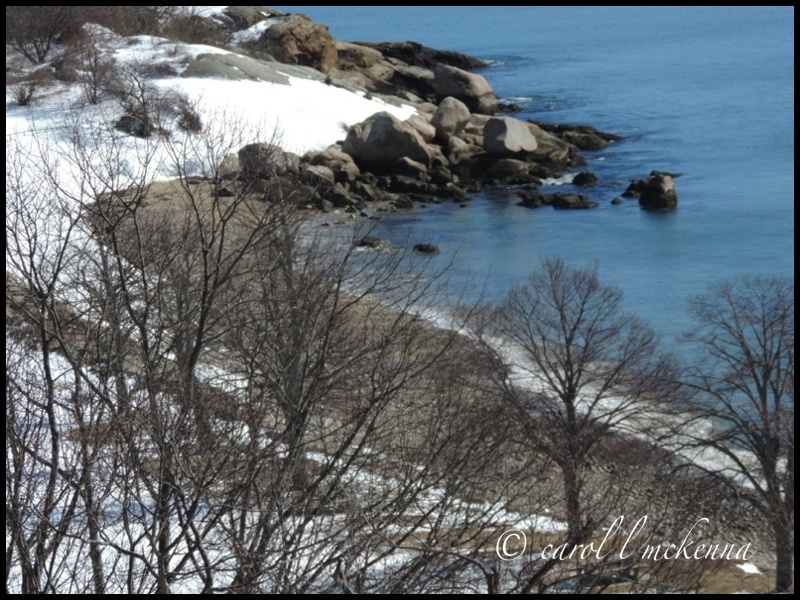 The beach on Cape Ann MA awaits for the weather to change. 'There she is with that 'dang' camera.' Maybe if I don't look she won't see me. A Haiku for you and my 'muse' ~ she teaches me many things. Your posted comments are a treasure to us. thanks! Very beautiful sequence of shots. You still have so much snow but hopefully you will have more and more sunshine to speed up the thaw. Beautiful shots. 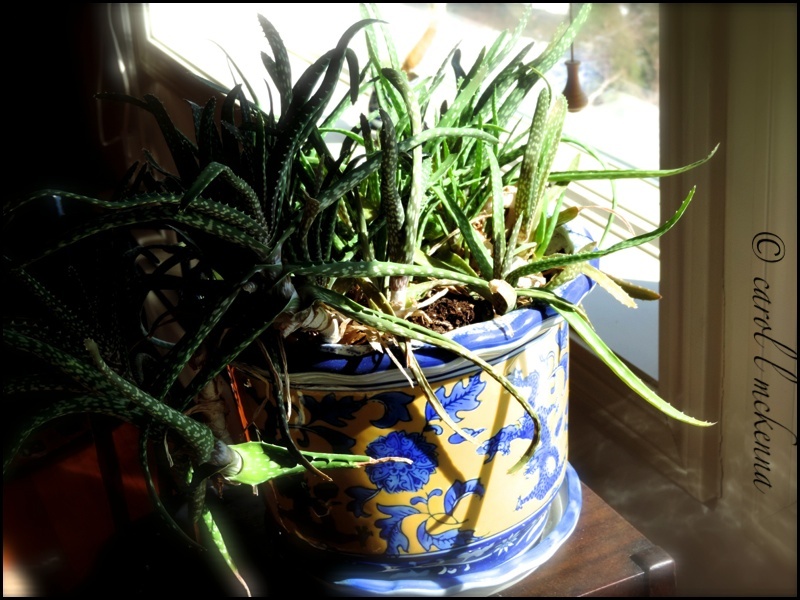 I think your aloe vera plant is happy with some sun. The picture of the ocean with the boat or barge is awesome. So is your doggy! I bet y'all can't wait for it warm up and all the snow to go away for a while. If so, I send you many positive vibes for warm days to come soon. Wanted to stop by and say hello! Fabulous photos: I love your doggie and the b&w. You're really just shining with these! I hope you've been well. Me? Finished up grad school and got offered a new job. It's great except I'm finishing up at the old one, house is for sale, and trying to slowly make the transition to the new job, 1.5 hours away. Whew! We've only had five feet of snow this winter, and it's all melted in the recent warm sunshine. But your photos are beautiful - the sun on the water is perfect! Wonderful series of winter shots. Beautiful captures, Carol, as always!! Art Muse is the sweet patient one indeed!! She could definitely teach us a number of things!! Hope you both have a great week!! That first shot is like a sea of diamonds. Oh, isn't it so delicious to see the sun again? Lovely shots. Beautiful! We've finally had some sunny days here as well. It makes such a huge difference. Bom dia, fotos de magnifica qualidade com enorme beleza, admiro o género. I bet you're happy to see some sunshine. Here's wishing you two some warm days that will remove all that snow from your background. Does your adorable fur person like the snow? Love the glistening water,I enjoy imagining how it looks in reality. Ah, these fur persons........I often think they actually believe they are unseen when looking the other way......out of sight out of mind! Art muse dog is just adorable! Love the black white shot of the snow..I hope it is melting away there! Your dog is so cute! Love the planter shot! Haha, Artmuse reminds me of little children playing hide and seek. They think if they hide their faces and cannot see you, they cannot be seen. Happy St. Patrick's Day Carol. I can see that everyone in the northern hemisphere is yearning for spring. Whilst we here in south west Australia are moving in autumn and a cooler day today. Happy days for you and the Art muse dog. and thank you for stopping by my blog today. 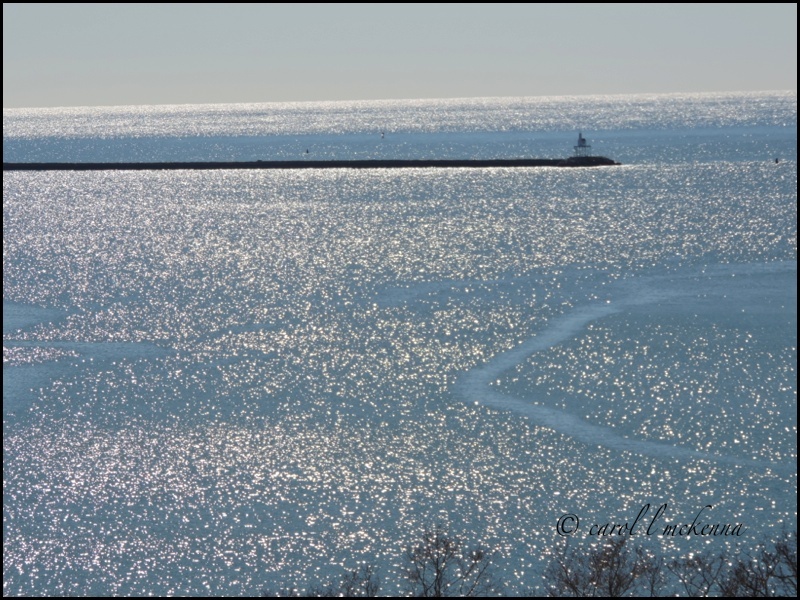 Love the sun glistening on the water, gorgeous! Wonderful pictures. Your dog is such a cutie. Love the shadows on the snow and the sunlit plant in the window. And. of course, little Art Muse Dog. Amazing photos especially the snow beach! I don't think I've ever seen that before. I've always lived in hot countries with sand and sea. I think I quite like the look of snow and sea although I wouldn't dip my toes in. Thanks for sharing your springy shots. So many lovely pictures ... the glistering harbour and tree shadows in the snow ones really caught my eye. Thanks for sharing (and for your comment on my blog). What a sweet adorable little pup. Your first and last photos are my super favorites, but they are all lovely. I love that b/w shot --stunning! Great lines and shadows in that black and white. Little Art Muse dog is cracking me up! I bet that lil cutie is thinking, "Will she ever tire of taking my photos. Ah...the price one pays because I am so cute!" Your photos, snow and all, are spectacular. We are expecting rain tonight. I am hopeful our warmer weather is a sign of Spring really sticking around. Have a beautiful weekend dear Carol. Hugs from Colorado ! 'Until one has loved an animal a part of one's soul remains unawakened,' ~ Anatole Frank this is so truth. My husband will be 60, and he still talk emotionally about his puppy that died when he was young. Those plants like to be put in the sunshine, Carol. Art can take care of herself, I see she found the sun also. Our weather person is saying that you will have more snow tonight or tomorrow. I love to see Artmuse but really enjoyed the glistening water today too. Great shots, I especially liked the glistening sea. Ah, ArtMuse Dog, you know that camera will always follow you around, no matter if you're looking at it or not!! Your mommy's pictures are all so beautiful! What lovely shots of snow and shadows - and of course, of your dog. Love that black and white of your backyard, so much mood and interest. I've always loved that quote by Anatole France. It really describes the bond I shared with my cat. It wont be long before all is green and lush again. Such is the way Mother Nature works, trying our patience - than rewarding with beauty. LOVE the Anatole Frank quote...so true. Yes, the lessons are everywhere--if only we will learn them! So glad that R ray of sunshine made it's way to your window. Happy Spring! 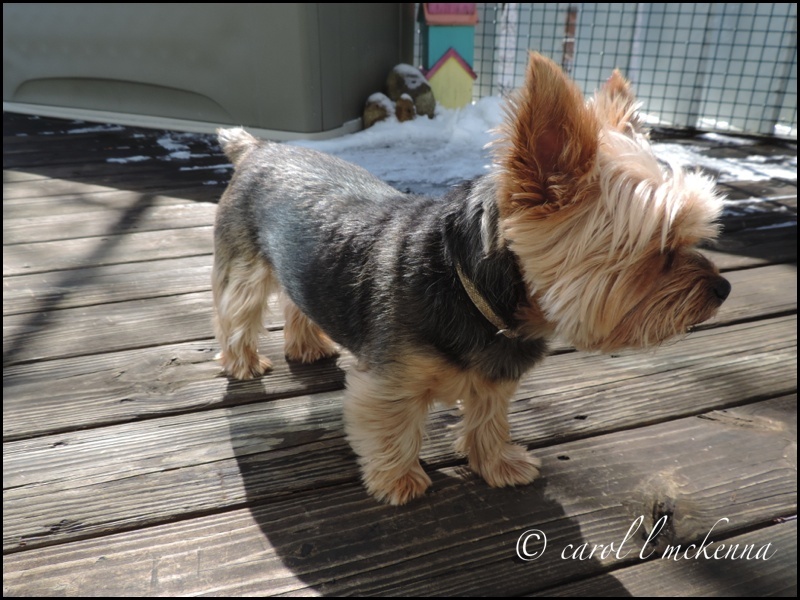 blessed are our furry, feathered, scaly friends… hearts beat and love connects us being to being… Beautiful photos and thoughts Carol… I suspect a few flakes may fall here tonight, but not enough to delay springs arrival in all her glory as she makes a slow, steady entrance! Hello Carol, Happy Spring to you. It always astounds me to see photos of snow next to an ocean shore line. I just didn't think that happened. I love that beautiful glistening sunshine shot! Gorgeous shadows! Your little Fur Person is so cute! I'll bet you learn a lot from her. Sun and snow, who is strong? Beach and snow in the same picture, amazing. I love your b&w pic. So many things to see. 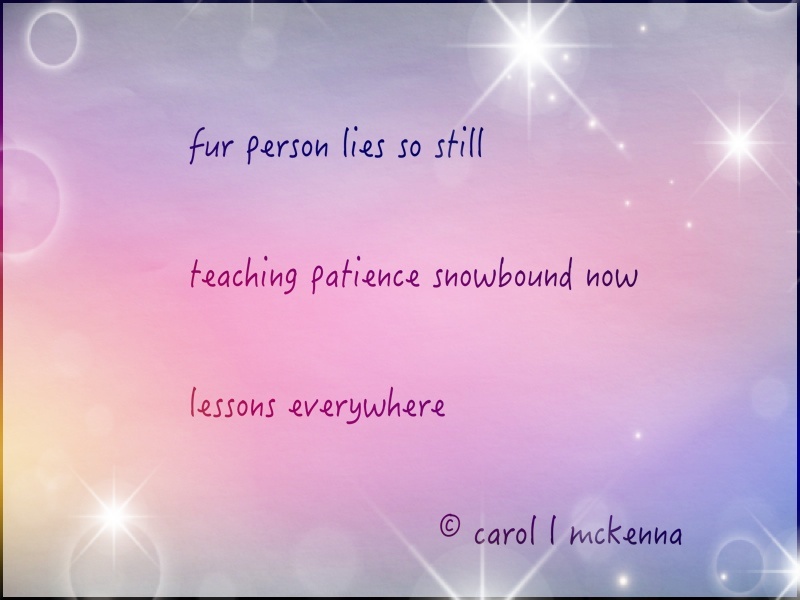 And if it's white fur on the snow, it's the best possible lessons. Survival. At least we have sun and shadows now, right!?! Thanks for linking up!